Text	 PROPITIOUS MONTHS AND DAYS FOR ACTIVITIES DURING THE WHOLE YEAR, SUCH AS: IF HE BRINGS HIS WIFE INTO HIS HOUSE, IF A BABY IS BORN, IF HE RECITES THE SHIGU-PRAYER, ETC. 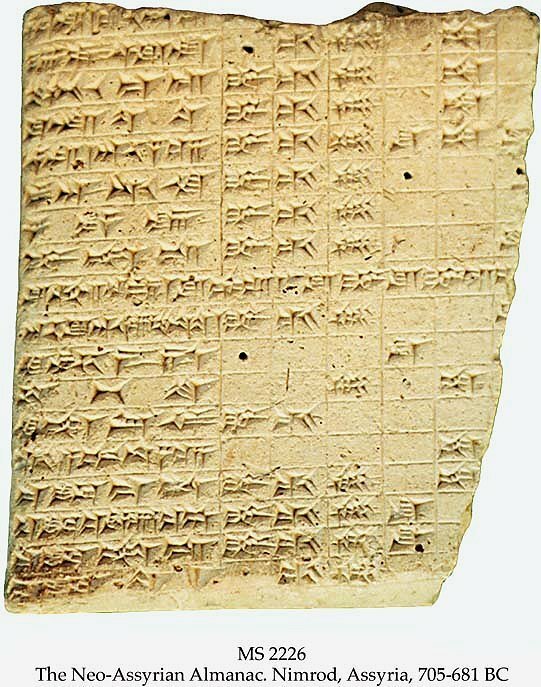 Description	 MS in Neo-Assyrian on fine yellow-coloured clay, Nimrod, Assyria, 705-681 BC, 1 tablet, lower left-hand part, 8,1x6,9x2,6 cm, 7 and 2 columns, 18+17+18 lines in a magnificent cuneiform script by the scribe, Nabû-zuqup-kena. For the Middle Babylonian almanac, see MS 2781. The present tablet joins the lower right-hand piece, K 98, now in British Museum, published by A.H. Sayce in Zeitschrift für Assyriologie, 2 (1887), pp. 333-35. Commentary	 Nabû-zuqup-kena was a well known Assyrian scribe. His grandfather Gabbi-ilani-eresh had been chief scribe to the kings Tukulti-Ninurta II and Ashurnasirpal II (891-859 BC). 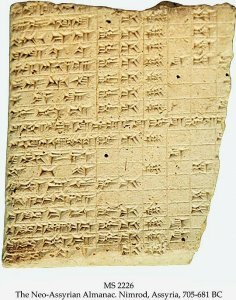 His grandson, Ishtar-shumu-eresh, son of Nabû-zeru-lsir, was a major expert and advisor to the kings Esarhaddon and Ashurbanipal (669-631 BC), titled scribe. Nabû-zuqup-kena seems to have been less active as a royal advisor, but more devoted to training royal scribes and copying texts. He records in one colophon that he strained his eyesight copying out texts for the education of his son Ishtar-shumu-eresh. Nabû-zuqup-kena's private library was largely taken over by king Ashurbanipal, when he began to collect his royal library. Exhibited	 "The Story of Time", Queen's House at the National Maritime Museum and The Royal Observatory, Greenwich, Dec. 1999 - Sept. 2000. Colophon	 Favourable days for doing what one wants, or on which any one may attain his wish: favourable: together with 25 lines of commentary on it. Extracts from "If he destroys and builds" based on many tablets, "If a city is set on a hill", "If he destroys and builds", and "Favourable (Days)". An original of Babylon, belonging to Nabû-zuqup-kena, scribe. Cfr. MS 1687, tablet no. 66 in the series "If a town is situated on a hill".